VII.2.6 Pompeii. 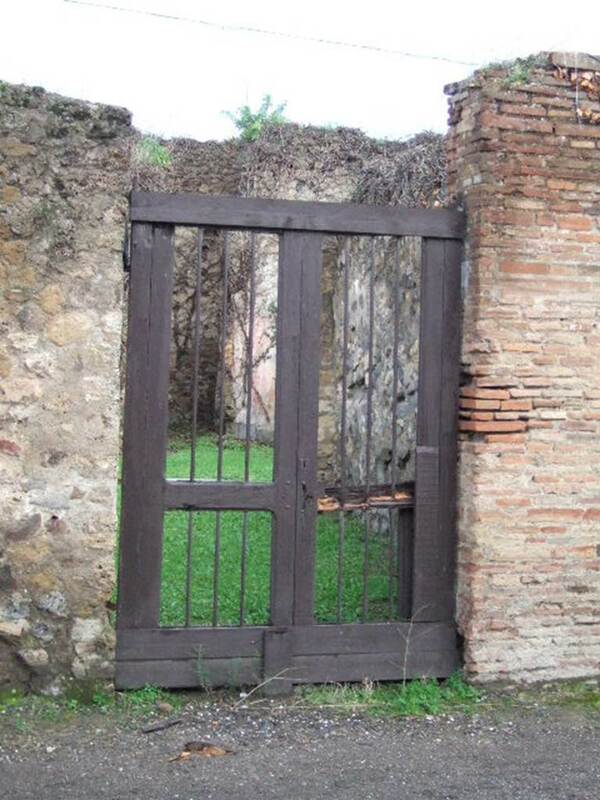 House of T. Terentius Neo. Excavated 1843, 1852, 1862 and 1868. (Strada Stabiana 32). VII.2.6 Pompeii. December 2005. Entrance. VII.2.6 Pompeii. May 2006. Looking west from entrance. VII.2.6 Pompeii. December 2004. Atrium with impluvium, looking east towards entrance, from rear. 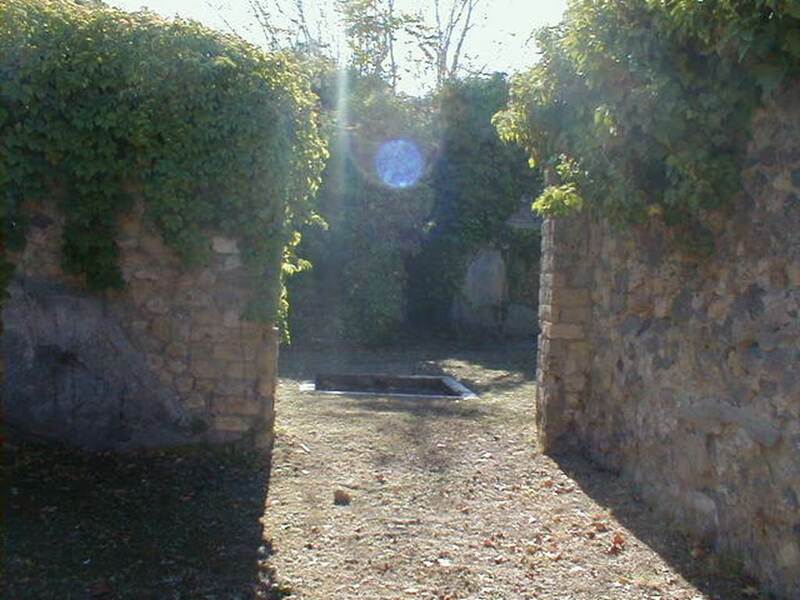 On the right is the doorway to a cubiculum in the south-east corner of the atrium. VII.2.6 Pompeii. December 2004. Stucco decoration in cubiculum with vaulted ceiling in north-east corner of atrium. 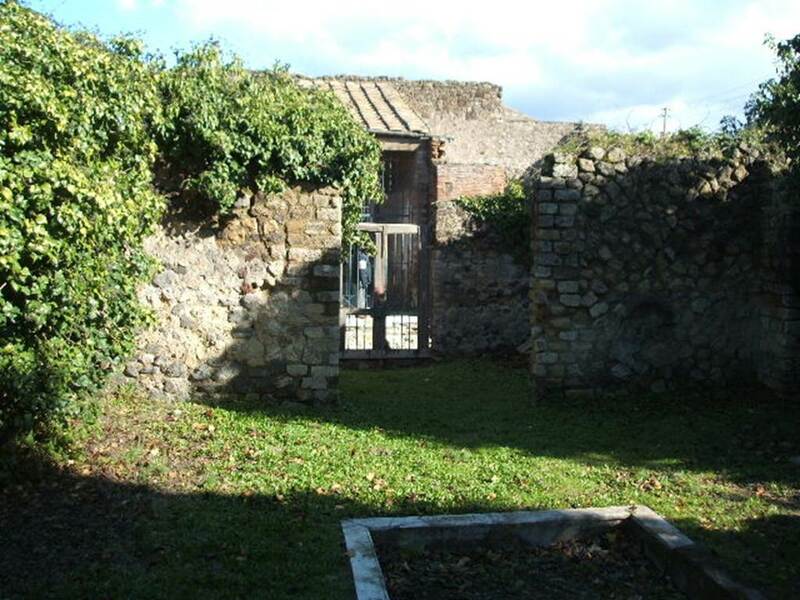 This cubiculum had a red zoccolo subdivided into panels, in the central panel was a plant with long leaves. In the middle area of the wall, it was painted white, showing two panels divided by a narrow compartment with a candelabra painted between them. The upper area of the wall was also white, subdivided into squares edged in red. The stucco edged vault of the room was above this. VII.2.6 Pompeii. December 2004. 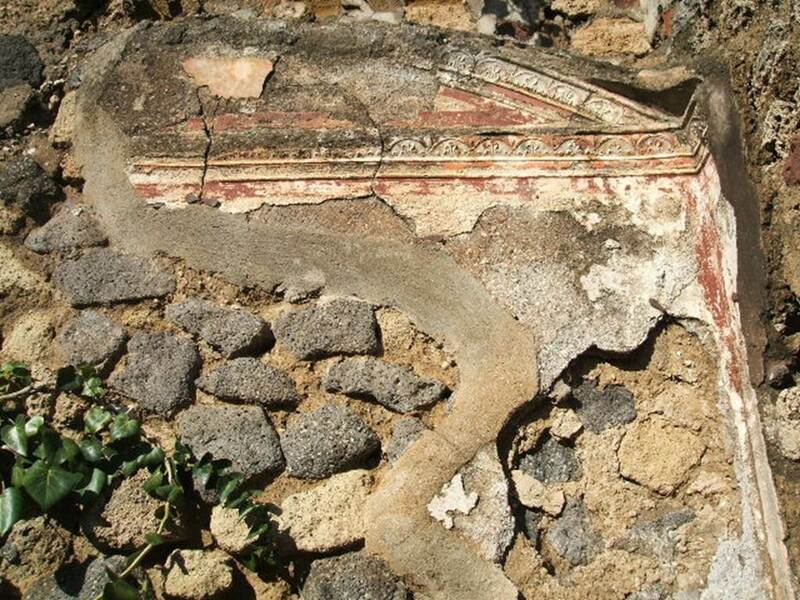 Painted wall decoration on north wall of cubiculum in north-west corner of atrium. 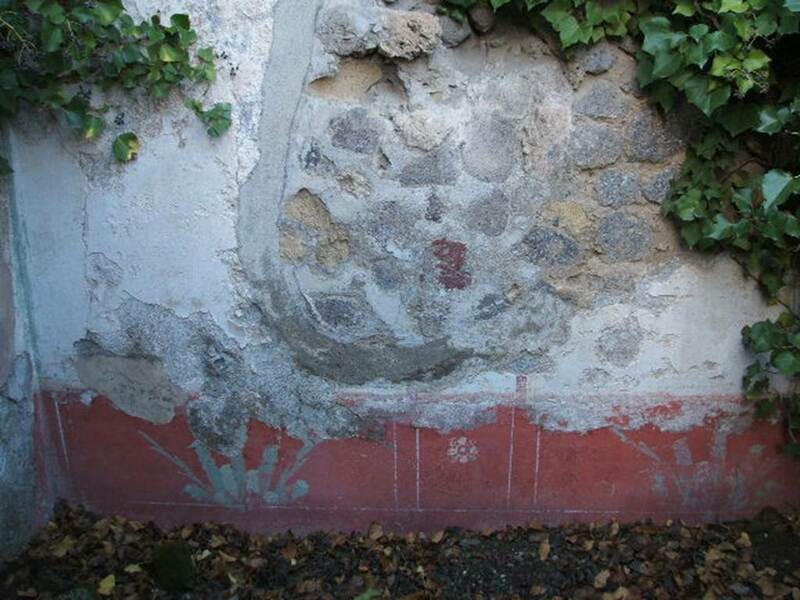 The north wall had a red zoccolo, with a central compartment containing a painted rosette with four petals, in the two side panels were painted plants. The middle zone was painted white. All the walls of this room seemed to have a similar scheme but were faded and most of the plaster was missing. Found here were, among others, a panel of a “Cupid with a bunch of grapes held high in the right hand” (Sogliano 285), and a “female crowned figure, naked except for a veil that fell from her arms behind her shoulders, carrying a face in the right hand and a basket of flowers in the left hand” (Sogliano 795). See Sogliano, A., 1879. Le pitture murali campane scoverte negli anni 1867-79. Napoli: Giannini. (Sog. p.56, no. 285, and p. 155, no.795). VII.2.6 Pompeii. 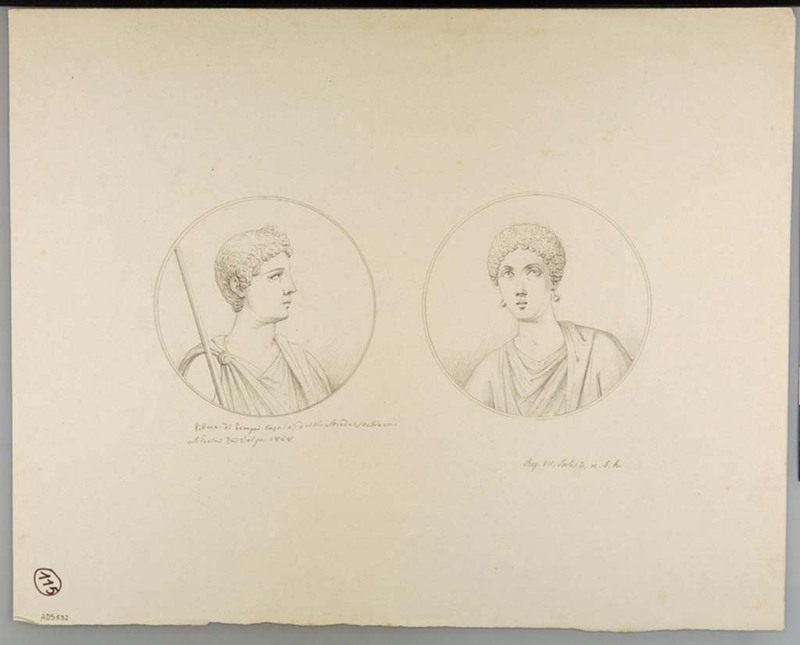 Portrait of Terentius Neo and his wife. Found on north wall of exedra/tablinum in centre of north side of atrium. Now in Naples Archaeological Museum. Inventory number: 9058. In the upper zone of the painted architecture was a fresco of Cupid and Psyche. The red zoccolo showed a painted plant in the centre panel, and painted garlands with peacocks on them in the side panels. In the middle zone of the wall, the central panel was painted white, which separated the two yellow side panels. In one of these side panels, “but already very faded and nearly vanished” was the painting of “Nike standing on a shelf, and carrying a trophy on his left shoulder”. VII.2.6 Pompeii. 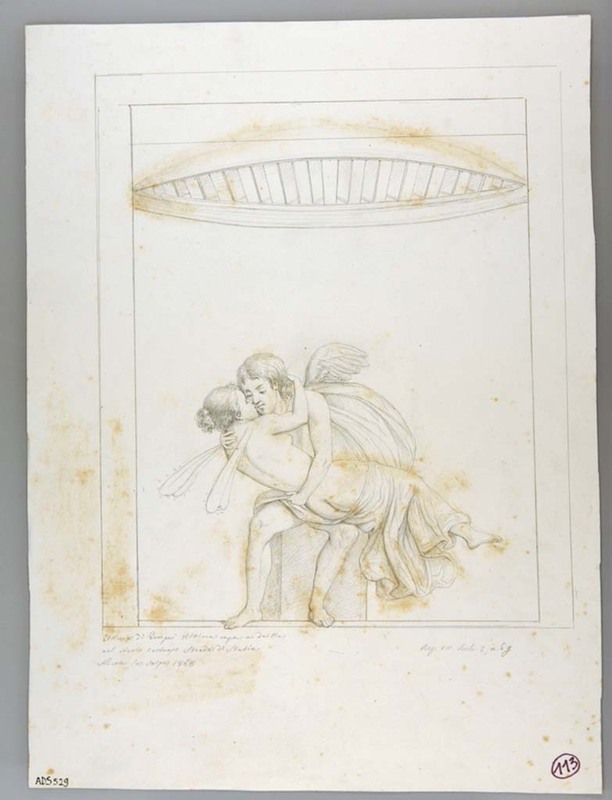 Drawing by Nicola La Volpe, (1868), of a fresco found in the upper zone of the painted architecture of the tablinum, of Cupid and Psyche. 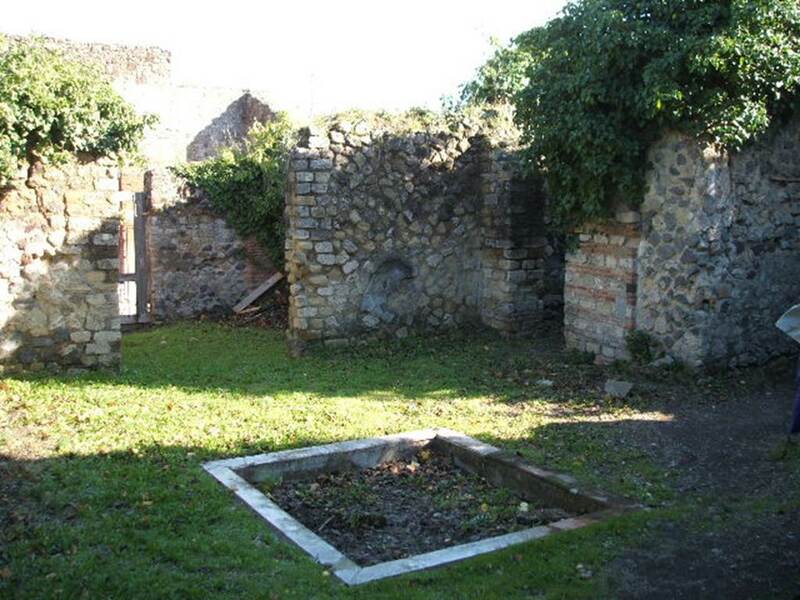 (Sogliano 394). Now in Naples Archaeological Museum. Inventory number ADS 529. 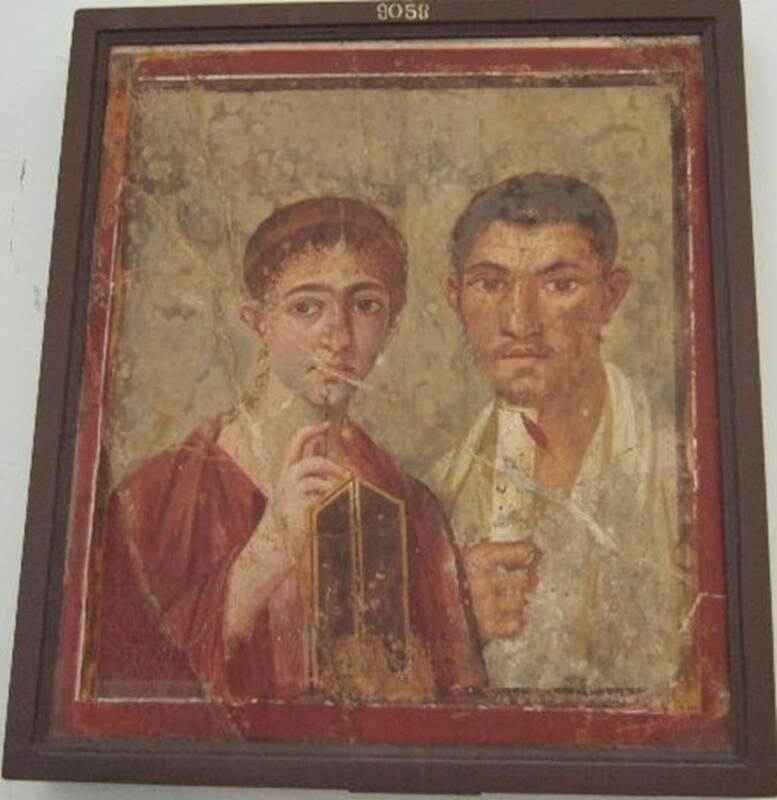 The original fresco is now In Naples Archaeological Museum, inventory number 9195. See Sogliano, A., 1879. Le pitture murali campane scoverte negli anni 1867-79. Napoli: Giannini. (See p.67, no. 394). VII.2.6 Pompeii. 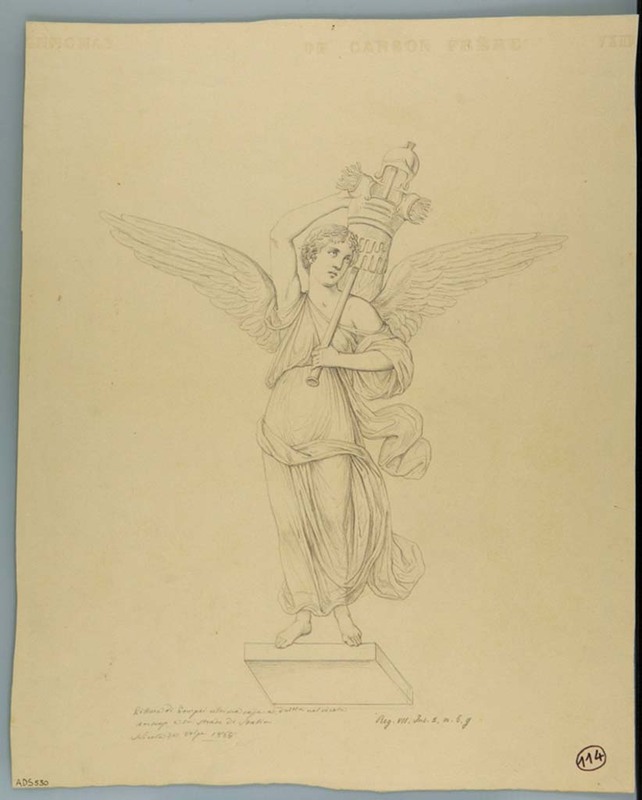 Drawing by Nicola La Volpe, (1868), of a fresco found in a side panel on the north wall of the tablinum. The fresco has now disappeared. See Sogliano, A., 1879. Le pitture murali campane scoverte negli anni 1867-79. Napoli: Giannini. (See p.72, no. 438). Now in Naples Archaeological Museum. Inventory number ADS 530. VII.2.6 Pompeii. 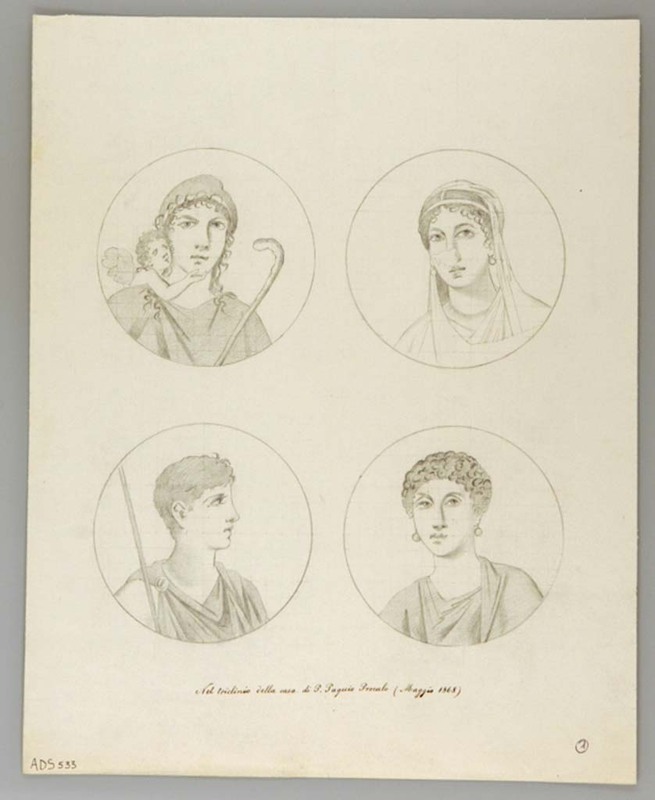 Drawing by Nicola La Volpe, 1868, of medallions found on a wall in the corridor on the south side of the triclinium. The medallion on the left is described as Paris with a cupid (Sogliano 557). 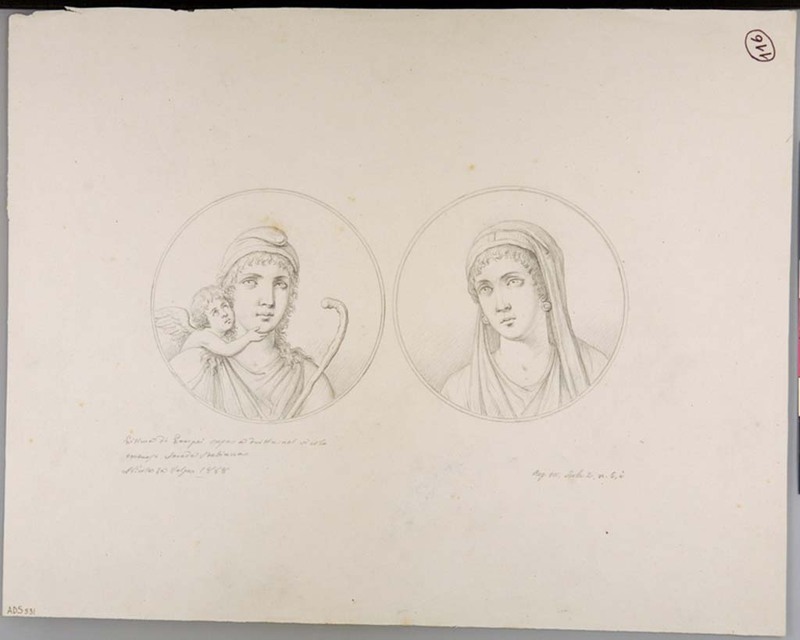 The one on the right is described as a female head or a veiled head, or even Helen, (Sogliano 566). The medallions have now faded and disappeared. See Sogliano, A., 1879. Le pitture murali campane scoverte negli anni 1867-79. Napoli: Giannini. (See p.105, no.557, and p. 107-8, no.566). Now in Naples Archaeological Museum. Inventory number ADS 531. The medallion on the left with a masculine head (Sogliano 635) and the other with a feminine head (Sogliano 634). These medallions have faded and disappeared. See Sogliano, A., 1879. Le pitture murali campane scoverte negli anni 1867-79. Napoli: Giannini. (See p.130, no. 635, and no. 634). Now in Naples Archaeological Museum. Inventory number ADS 532. VII.2.6 Pompeii. Drawing (May 1868) by anonymous painter of four medallions, (now disappeared), from triclinium in north-west corner of atrium. These are the same as above drawings by La Volpe, which are attributed to the corridor, on the south side of the same triclinium. Now in Naples Archaeological Museum. Inventory number ADS 533.